The 2009 flu pandemic or swine flu was an influenza pandemic, and the second of the two pandemics involving H1N1 influenza virus (the first of them being the 1918 flu pandemic), albeit in a new version. First described in April 2009, the virus appeared to be a new strain of H1N1 which resulted when a previous triple reassortment of bird, swine and human flu viruses further combined with a Eurasian pig flu virus, leading to the term "swine flu". Unlike most strains of influenza, H1N1 does not disproportionately infect adults older than 60 years; this was an unusual and characteristic feature of the H1N1 pandemic. Even in the case of previously very healthy people, a small percentage will develop pneumonia or acute respiratory distress syndrome (ARDS). This manifests itself as increased breathing difficulty and typically occurs 3–6 days after initial onset of flu symptoms. The pneumonia caused by flu can be either direct viral pneumonia or a secondary bacterial pneumonia. In fact, a November 2009 New England Journal of Medicine article recommends that flu patients whose chest X-ray indicates pneumonia receive both antivirals and antibiotics. In particular, it is a warning sign if a child (and presumably an adult) seems to be getting better and then relapses with high fever, as this relapse may be bacterial pneumonia. Initially called an "outbreak", widespread H1N1 infection was first recognized in the state of Veracruz, Mexico, with evidence that the virus had been present for months before it was officially called an "epidemic". The Mexican government closed most of Mexico City's public and private facilities in an attempt to contain the spread of the virus; however, it continued to spread globally, and clinics in some areas were overwhelmed by infected people. In late April the World Health Organization (WHO) declared its first ever "public health emergency of international concern," or PHEIC, and in June the WHO and the U.S. CDC stopped counting cases and declared the outbreak a pandemic. The pandemic began to taper off in November 2009, and by May 2010, the number of cases was in steep decline. On 10 August 2010, the Director-General of the WHO, Margaret Chan, announced the end of the H1N1 pandemic, and announced that the H1N1 influenza event has moved into the post-pandemic period. According to the latest WHO statistics (as of July 2010), the virus has killed more than 18,000 people since it appeared in April 2009, however they state that the total mortality (including deaths unconfirmed or unreported) from the H1N1 strain is "unquestionably higher". Critics claimed the WHO had exaggerated the danger, spreading "fear and confusion" rather than "immediate information". The WHO began an investigation to determine whether it had "frightened people unnecessarily". A flu follow-up study done in September 2010, found that "the risk of most serious complications was not elevated in adults or children." In an 5 August 2011 PLoS ONE article, researchers estimated that the 2009 H1N1 global infection rate was 11% to 21%, lower than what was previously expected. However, by 2012, research showed that as many as 579,000 people could have been killed by the disease, as only those fatalities confirmed by laboratory testing were included in the original number, and meant that many of those without access to health facilities went uncounted. The majority of these deaths occurred in Africa and Southeast Asia. Experts, including the WHO, have agreed that an estimated 284,500 people were killed by the disease, much higher than the initial death toll. Research later indicated that the severe flu effects in healthy young and middle-aged adults are caused by an excessive immune response. It has been determined that the strain contains genes from five different flu viruses: North American swine influenza, North American avian influenza, human influenza and two swine influenza viruses typically found in Asia and Europe. Further analysis has shown that several proteins of the virus are most similar to strains that cause mild symptoms in humans, leading virologist Wendy Barclay to suggest on 1 May 2009, that the initial indications are that the virus was unlikely to cause severe symptoms for most people. U.S. President Barack Obama being vaccinated against H1N1 flu on 20 December 2009. In January 2010, Wolfgang Wodarg, a German deputy who trained as a physician and now chairs the health committee at the Council of Europe, claimed major firms had organised a "campaign of panic" to put pressure on the World Health Organisation (WHO) to declare a "false pandemic" to sell vaccines. Wodarg said the WHO's "false pandemic" flu campaign is "one of the greatest medicine scandals of the century". He said that the "false pandemic" campaign began last May in Mexico City, when a hundred or so "normal" reported influenza cases were declared to be the beginning of a threatening new pandemic, although he said there was little scientific evidence for this. Nevertheless, he argued that the WHO, "in cooperation with some big pharmaceutical companies and their scientists, re-defined pandemics", removing the statement that "an enormous amount of people have contracted the illness or died" from its existing definition and replacing it by stating simply that there has to be a virus, spreading beyond borders and to which people have no immunity. In June 2010, Fiona Godlee, editor-in-chief of the BMJ, published an editorial which criticised the WHO, saying that an investigation had disclosed that some of the experts advising WHO on the pandemic had financial ties with drug companies which were producing antivirals and vaccines. Margaret Chan, Director-General of the WHO, replied stating, "Without question, the BMJ feature and editorial will leave many readers with the impression that WHO's decision to declare a pandemic was at least partially influenced by a desire to boost the profits of the pharmaceutical industry. The bottom line, however, is that decisions to raise the level of pandemic alert were based on clearly defined virological and epidemiological criteria. It is hard to bend these criteria, no matter what the motive". In August 2010, the Daily Mail printed an article stating that "a third of the experts advising the World Health Organisation about the swine flu pandemic had ties to drugs firms" and that of the 20 members of the Scientific Advisory Group for Emergencies, which advised the British Government on swine flu, 11 had done work for the pharmaceutical industry or were linked to it through their universities. A number of methods have been recommended to help ease symptoms, including adequate liquid intake and rest. Over-the-counter pain medications such as acetaminophen and ibuprofen do not kill the virus; however, they may be useful to reduce symptoms. Aspirin and other salicylate products should not be used by people under 19 with any flu-type symptoms because of the risk of developing Reye's Syndrome. is unknown. For more information, see "Data reporting and accuracy". Influenza surveillance information "answers the questions of where, when, and what influenza viruses are circulating. 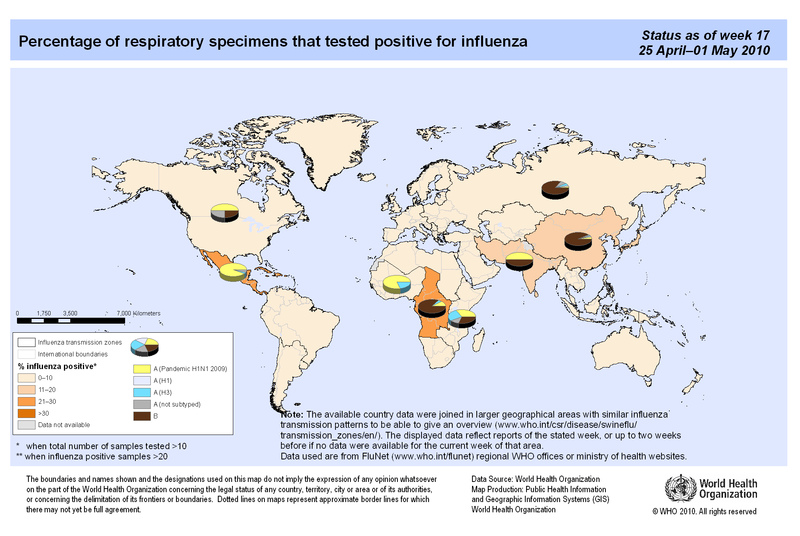 It can be used to determine if influenza activity is increasing or decreasing, but cannot be used to ascertain how many people have become ill with influenza". For example, as of late June 2009, influenza surveillance information showed the U.S. had nearly 28,000 laboratory-confirmed cases including 3,065 hospitalisations and 127 deaths; but mathematical modelling showed an estimated 1 million Americans currently had the 2009 pandemic flu, according to Lyn Finelli, a flu surveillance official with the CDC. Estimating deaths from influenza is also a complicated process. In 2005, influenza only appeared on the death certificates of 1,812 people in the US. The average annual US death toll from flu is, however, estimated to be 36,000. The CDC explains: "[I]nfluenza is infrequently listed on death certificates of people who die from flu-related complications" and hence, "Only counting deaths where influenza was included on a death certificate would be a gross underestimation of influenza's true impact". The 1918 flu epidemic began with a wave of mild cases in the spring, followed by more deadly waves in the autumn, eventually killing hundreds of thousands in the United States and 50- 100 million worldwide. The great majority of deaths in the 1918 flu pandemic were the result of secondary bacterial pneumonia. The influenza virus damaged the lining of the bronchial tubes and lungs of victims, allowing common bacteria from the nose and throat to infect their lungs. Subsequent pandemics have had many fewer fatalities due to the development of antibiotic medicines which can treat pneumonia. ↑ Not necessarily pandemic, but included for comparison purposes. ↑ The ratio of confirmed deaths to total deaths due to pandemic H1N1/09 flu is unknown. For the difficulties in estimating the ratio, see "Data reporting and accuracy"; for some modelling estimates see below. ↑ Lua error in Module:Citation/CS1/Identifiers at line 47: attempt to index field 'wikibase' (a nil value). This study involved a total of 272 patients, which represents approximately 25% of U.S. hospitalized patients with lab-confirmed H1N1 whose cases were reported to the U.S. Centers for Disease Control and Prevention (CDC) from 1 May 2009, to 9 June 2009. The study found that "the only variable that was significantly associated with a positive outcome was the receipt of antiviral drugs within two days after the onset of illness" [Outcomes section, 2nd paragraph] and also that "only 73% of patients with radiographic evidence of pneumonia received antiviral drugs, whereas 97% received antibiotics." [Discussion section, 8th paragraph]. It is recommended that such patients receive both. ↑ 145.0 145.1 145.2 Lua error in Module:Citation/CS1/Identifiers at line 47: attempt to index field 'wikibase' (a nil value). ↑ 178.0 178.1 178.2 Lua error in Module:Citation/CS1/Identifiers at line 47: attempt to index field 'wikibase' (a nil value). ↑ 182.0 182.1 182.2 Lua error in Module:Citation/CS1/Identifiers at line 47: attempt to index field 'wikibase' (a nil value). ↑ "H1N1 Swine Flu May Have Killed 15 Times More Than First Said". ABC News Medical Unit. 26 June 2012. <templatestyles src="Module:Citation/CS1/styles.css"></templatestyles>, citing Lua error in Module:Citation/CS1/Identifiers at line 47: attempt to index field 'wikibase' (a nil value). This page was last modified on 24 May 2016, at 11:06.